Bushmaster M16A2 3-Shot Burst Kit. This Bushmaster-manufactured parts kit is made to the highest standards and workmanship. Installation of this set in your M16A1 machine gun will give you a 'three-shot burst' capability as in the M16A2. Not legal for installation in anything but a licensed machine gun. Originally, Bushmaster made these for U.S. government contracts back in 2002. Now, they are one of only 2 sources of these hard to find 3-round burst kits available in the USA. So all you need is this and An M-16 lower parts kit and you have a 3 round burst complete kit. 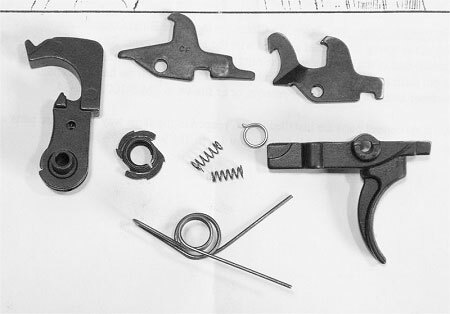 We also sell M16 lower parts kits. The difference between the A2 kit & the M4 burst kits is that the A2 Kit has longer dwell times and the M4 burst kit handles a faster cyclic rate. PLEASE OBEY ALL NFA & BATF RULES & STATE REGULATIONS!